New Macquarie University research, published in the journal Proceedings of the Royal Society B, has shown that birds and pterosaurs did, in fact, co-exist for millions of years peacefully, as opposed to the long-held and historical belief that birds competitively-displaced pterosaurs as suggested. It had previously been suggested that birds and pterosaurs competed with each other during the Cretaceous, a period more than 65 million years ago, and that this led to pterosaurs evolving larger body sizes to avoid competition with the smaller birds. However, after comparing jaw sizes, limb proportions and other functional characteristics not explored in previous studies, lead author Dr Nicholas Chan says this is not the case. The research used morphospaces, a way of mapping the forms of organisms, and found distinct ecological separation between the two groups based on size, features of the wings and legs and feeding adaptations. In other words, this would suggest that the two were not long term competitors. Had the two been in direct competition, birds were believed to have been the reason that pterosaurs evolved into larger species in order to avoid competition for resources. "Any competition between the two groups was likely localised over a relatively short periods of time," says Dr Chan, from the Department of Biological Sciences at Macquarie University. "While previous research only compared the limb bones of the two groups, our research compared jaw lengths, wing and leg proportions in order to determine functionally-equivalent traits, and found that the there was very little ecomophological overlap between the two." "The difference in the species functional morphology means that both groups co-existed without ongoing competition. Birds had shorter mid-wings, longer metatarsals, and shorter jaws. 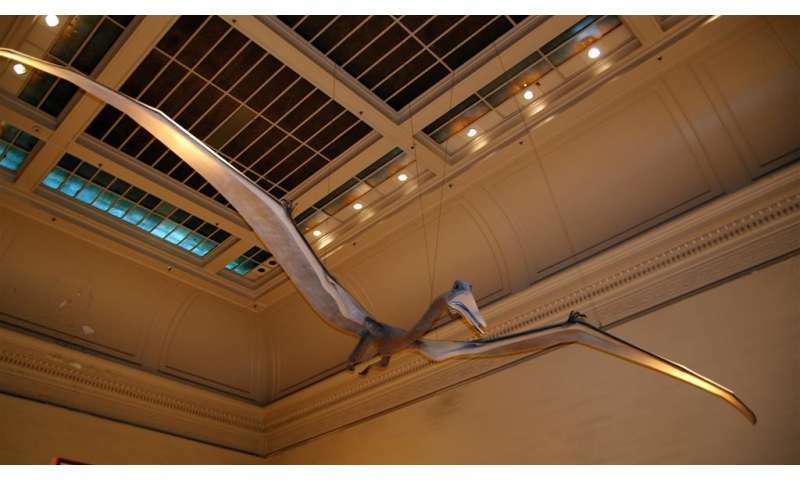 So they likely flew, walked, and fed differently from pterosaurs." Did pterosaurs feed by skimming?